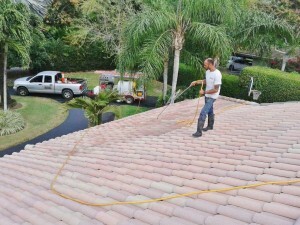 Using a low pressure rotary surface cleaner to gently clean your tile roof. Ultra Pressure Cleaning does roofs. 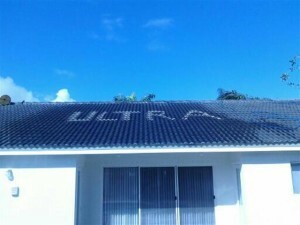 It's important to clean a roof before the algae spreads. 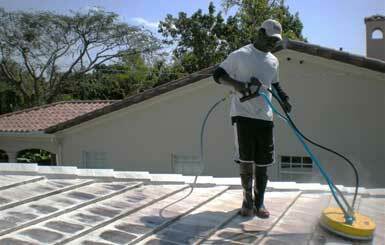 Algae can cause stains on a roof. 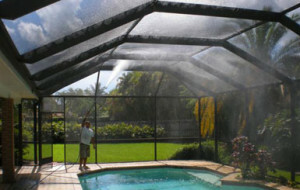 People who live in humid areas like Miami have seen those dark streaks on their roof or the green patches on their pool walls. Many individuals wonder what causes these stains, but we at Ultra Pressure Cleaning find that the culprit is often a type of algae. Algae spores enter these spaces commonly through wind, rain, or swimmers entering the pool. Once algae is present in an area, it then begins to spread very quickly. While this plant does not pose health issues, algae can ruin the aesthetic of one’s home and make a pool unusable for weeks. For this reason, it is critical to have a professional inspect the problem and provide the proper services to remove algae before it’s too late. Many Miami and South Florida residents with pools have to deal with the inevitable presence of algae. In most cases, algae found in pools is usually caused by inadequate, free available chlorine levels, high pH, or dirt and slime that has already accumulated on pool surfaces. Green algae: Green algae is the most common type of algae discovered in pools and residential areas. This kind of algae is free-floating and can turn a pool green in only a few hours. It is also the easiest to avoid and to eliminate. Black Algae: Often found in the shady areas of pools, black algae forms in cracks on pool surfaces, especially pools with plaster finish. It also appears as a black mat or slippery spots around pool surfaces. Mustard Algae: This algae type appears as orange, yellow, or mustard-colored spots on the walls and floors of pools. Similar to black algae, it prefers to grow in shaded areas. Mustard algae is easy to brush off temporarily but one needs a special algaecide product to eliminate it completely. Regardless of the type, the rapid accumulation of algae is sometimes noticed when it is too late, making it too costly to correct. Many homeowners try to control algae growth on their own by using different over-the-counter products. Many of these chemicals do not eradicate the issue, so homeowners who really wish to curb algae growth should consider the help of a professional. Besides growing in pools, algae is a common issue spotted on roofs across the United States. When homeowners spot dark stains or streaks on their roof, they commonly mistake them for roof mold or mildew. In reality, the root problem of these stains comes from common type of blue-green algae known as gloeocapsa magma. This blue-green algae spreads when its spores are transported by natural elements, such as animals, rain and wind. 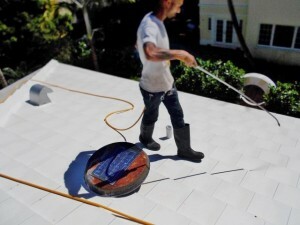 After landing on a roof, algae grows on areas with the least amount of sun where they can stay damp and also feed on limestone filler in the shingles. As algae continues to grow, it protects itself from damaging ultraviolent rays by producing a dark pigmented sheath. Over time, the algae beings to die, leaving dead cells to accumulate and create black streaks that make homes lose their aesthetic appeal. In addition to creating a poor exterior appearance, the algae also feeds on the limestone filler of shingles, damaging their condition. Eating away the filler can shorten shingle life and reduce the roof’s ability to properly reflect heat rays, which can lead to additional usage of air conditioning and higher energy bills. Many homeowners seeking a solution to remove algae from their property may initially try to get rid of the problem on their own by using over-the-counter chemical solutions or a high-pressure power washer to remove stains. Doing so, however, can often lead to additional damages that will increase the costs of repairing your home. Ultra Pressure Cleaning carefully inspects each site and provides service recommendations based on the size of the area affected and how long the algae has been present. With this attention to the specific services a project needs, Ultra Pressure Cleaning will help you remove any algae from your home and restore it back to its beautiful appearance.